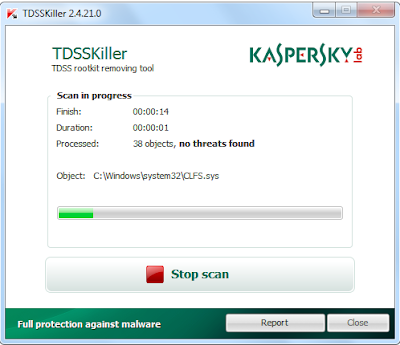 Trojan Troj/TDL3Mem-B infected to "C:\Windows\System32\ntdll.dll" can be disinfect using Kaspersky's TDSKiller.exe ,a free Rootkit.Win32.TDSS removal utility . 2. Close all programs including your web browser. Select "Services and drivers" and "Boot Sectors" and Click "Start Scan". 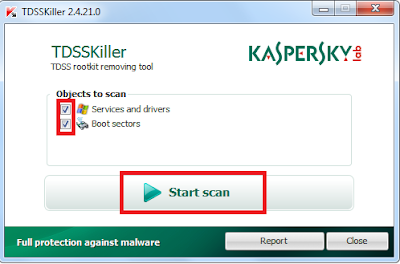 Select "Cure" option when the Tdsskiller.exe found "Rootkit.Win32.TDSS.tdl3" or similar threats , after removal restart the computer. and repeat the above mentioned steps to make sure that the threat is completely removed from the system. 5. Clear your %temp% folder. If you are unable to remove any files manually using normal delete function then use malware file remover -FileAssassin.exe. There is no removal utility from Sophos Antivirus . You must run this tool several times. Follow this procedure and make sure that all threats are removed.